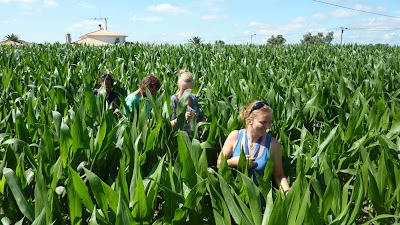 This probably will be the last post for this field course, from out of the field that is. The students are at home and Michel and I are on our way back, staying in hot hotel rooms after a simmering drive to the North of Spain in our blue jam jar. I am feeling like a fat dog after today. I am dedicating this post to all of our students, and in particular to Anna, who may have to explain some of the finesses of the English language in this gibberish post to her fellow students. With this field course done, they must be considered young humdingers of hydrologists. 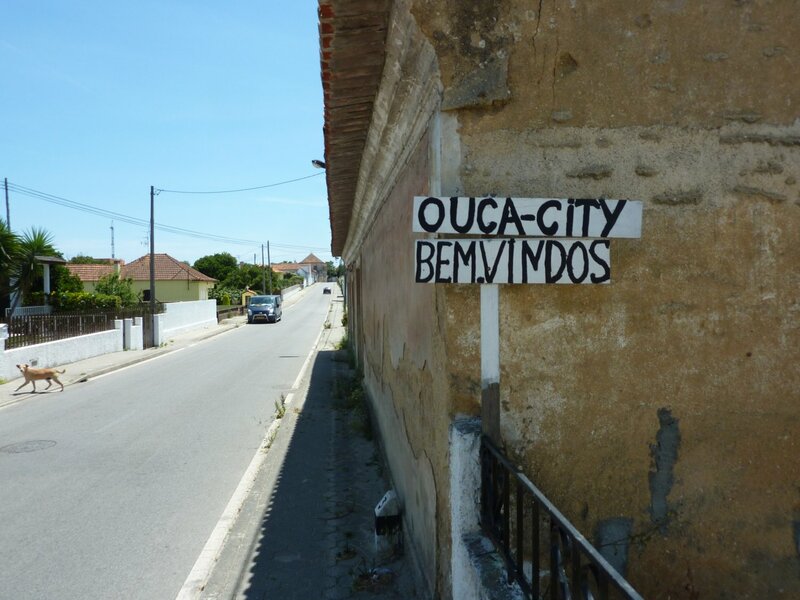 I would also like to thank all the Portuguese people for their hospitality and giving us who gave us access to their land. In particular, I would like to thank the Caromario family who threw us a party in Montouro that we'll never forget. 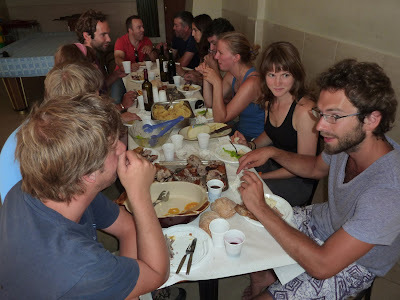 A picture of the delicious leitao offered to us already appeared in a previous post, but here it is again with people eating it. 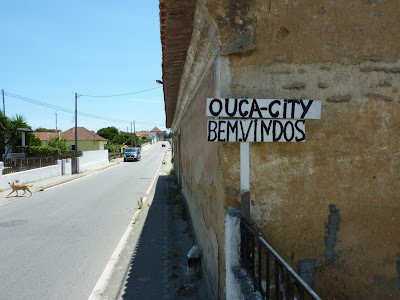 Mario, Carolina, muito obrigado para este festa com vinho, batates fritas e leitao! Leitao party in Montouro with Mario's family and friends. But let's not dwell on this too much, I do not want to get the mulligrubs, but go back to the balmy days in our the fields around the peaceful dwelling of Montouro, where we did a spiffy pumping test, VESses, and a lot of other things, all in a jiffy. Of course the men's team also went to the Sao Joao party in Porto, without any shot clogs that is. 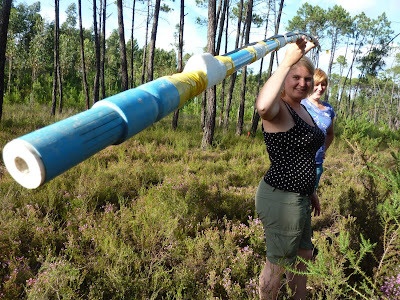 The pumping test was a first in this field course in Portugal and was made by six of our students (Rosa, Nadine, Sonia, Inge, Anna and Corine) within the smelly bounds of their garbage dump, which should be the perfect place for lingering bowerbirds. 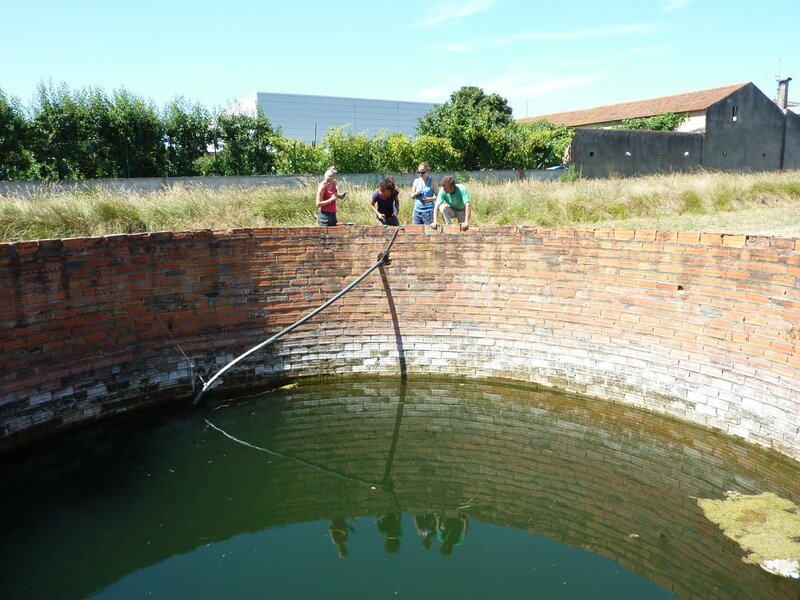 So for all of you twacks who aren't versed in hydrology and read this blog, a pumping test can be described as pumping groundwater from a perforated tube in the soil and measuring the change of the waterlevel in an adjacent tube that "sees" the drawdown caused by the removal of groundwater by the pump. This is usually done for fun by hydrologists to get out of their dull offices, but it also gives us some kind of estimate of the permeability of the soil for water flow. Excitement surrounding this mystical pumping test event. While Corine, Anna and Nadine are staring into a hole in the ground where mysterious flows of waters occur due to the action of our small pump, Rosa claps her hands in excitement as water is indeed entering the grey box and Sonia does a small dance also known as El Mapalé. Michel, the crambazzled looking guy, is leading the whole effort. 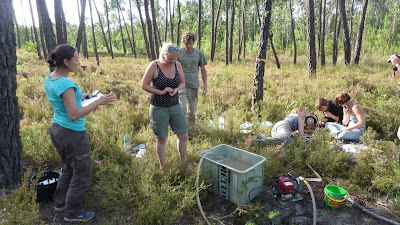 On the same day, they also manage to install a minifilter piezometer to analyse chemical profiles of the groundwater. So this was a great succes that had to be conquered by the thrillseeking "com uma rocketa" Hanson quartet. They decided to do their last Vertical Electrical Sounding, better known by the boys as their final VES. The idea was that they would find a shallow ridge of clay under their sandy catchment by looking at the resistivity values produced by their ruthless application of 400 volts to the soil. One of the Rugo twins decided that this was best done barefoot, not realising that their loyal partner Sjef could, by erroneously pressing a red button on the Terrameter, apply 400 volts to an electrode held by the barefoot wassack. To up it all, they had to use the booster enhancing the voltage to 800 volts. Such a mistake made by Sjef would have given a whole new meaning to the bad hair day look for one of these guys. This all happened next to a deep dug well, of which the kind but flabbergasted owner already had explained to them that there was no Argila to be found beneath his well. But after this action all remains hunky dory with our blokes. 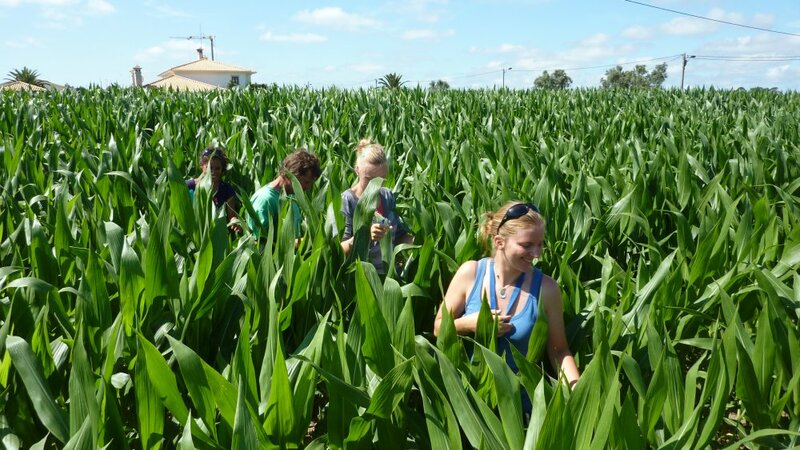 In the meantime, the Lieke, Carolina and Nikki (LCN) group managed not to get lost in a corn field while exploring a nifty deep well with nitrate-rich water. They also did manage to make a piezometer in their geologically complex area to make the first measurements of the water level in this formation and developed several daunting ideas to explain their geology. 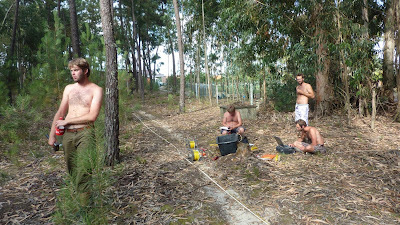 On the last days of our studies, everybody had to measure the change in storage in soil moisture and groundwater, which is often done in large dug wells (called Poços or Noras). 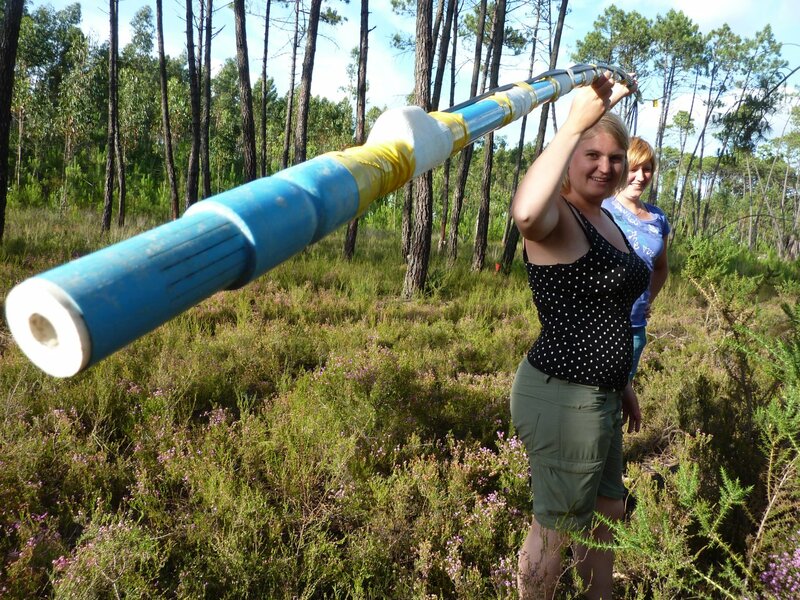 The picture below shows an oversized well being measured by LCN, again uder the watching eye of Michel. Now comes the hard part, that is writing up scientific reports of their findings. We'll keep you updated!! !